Baloochies Designs is a newly established fine jewelry store located in Levittown, New York. Baloochies opened its doors in 2008, primarily dealing with high quality diamonds, color gemstones, and custom made jewelry by our own manufacturing company overseas. Every design made at Baloochies will meet your imagination and specific needs. Our loyalty to our customers has provided us the recognition of a well-known, prestigious establishment in the Tri-County Jewelry Exchange. Policies: Within 7 days of purchase and original receipt exchange is acceptable. Layaway form of payment is acceptable for a 60 day time period. Repairs: We have an excellent repair service for our customers. Certain items can be fixed, sized, changed, soldered or watch batteries all on site while you wait. 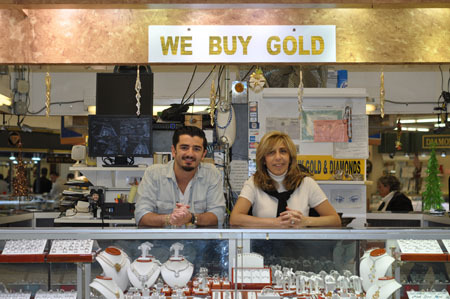 Customers can also watch their jewelry be repaired in front of them to meet their needs. Warranties for diamonds are life time guarantee. Payments: All forms of credit and debit cards with proof of identification is accepted. Gift certificates are available to purchase and use as cash for payment. Trading in old gold as a form of payment is acceptable as well.